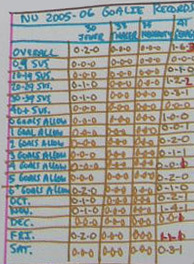 This section shows goaltender records. It shows the team's record when each particular goalie plays, followed by the team's record when each goaltender makes a particular number of saves. Then it breaks down the team's record based on the basis of number of goals allowed , followed by goalie records per month and day of the week . For example, The Huskies record when Jewer plays is 0-2-0. They are 0-3-1 when Geragosian makes 30 to 39 saves. They are 1-0-0 when Thaler allows no goals. The chart also shows that Jewer was 0-1-0 in October and Geragosian is 0-3-1 on Saturdays.